Dave Dubowski initially began his business with a stall in Petticoat Lane . He then went on in October 1923 to establish a general provision shop at 136 Church Street . 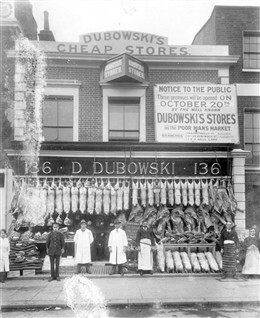 Dubowski’s Cheap Store was directly advertised as the “Poor Man’s Market”. The Kelly’s London Post Office Directories record that this shop continued to operate in Church Street until 1928. 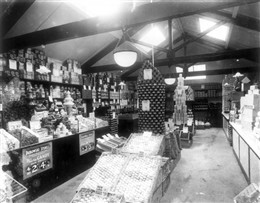 Then in 1929 Dubowski’s shop was replaced by a similar one run by the London Provision Stores Ltd. These images clearly show the wide range of produce that was available at this shop.